• Delta 4X30mm fixed magnification scope with Red & White LED Navigation lights and top mounted Back-Up Iron Sights. • The Electronic Control Panel is placed on top of the scope for Ambidextrous use. You can turn On/Off the Illuminated Reticle & LED NAV Lights, adjust the brightness level of the Illuminated Reticle, change select the Illuminated Reticle Color (Blue or Red) and the LED NAV Lights (White & Red). There are five brightness settings for the Illuminated Reticle. • Elevation adjustment is done with the accessible turret wheel on the bottom of the scope and the Windage adjustment is via the Turret on the side. • New GEN3 Integrated Auto Locking Quick Release Mount, fits Weaver/ Picatinny/ MIL-STD 1913 type rails. Features a redesigned and more compact lever. 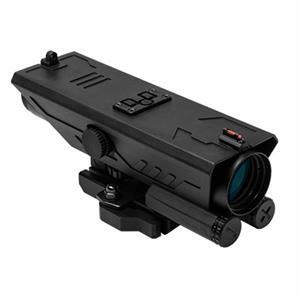 • Top mounted Backup Iron rear peep sight and Fiber Optic front sight post. • White & Red Navigation LED Lights for maneuvering in the Dark. 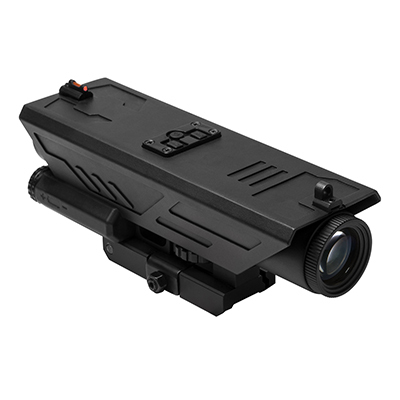 Lower powered lighting helps preserves users night vision and their ability for their eyes to see in the dark. Supplements bright Tactical lights, which may be too bright to use for Navigation. 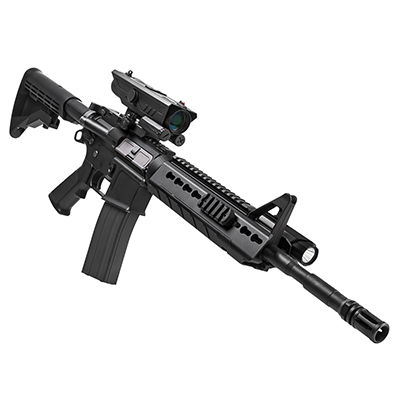 • AR15/ M4 1½” Scope Centerline height. • Fully Multi-Coated lens for a bright crystal clear image quality.